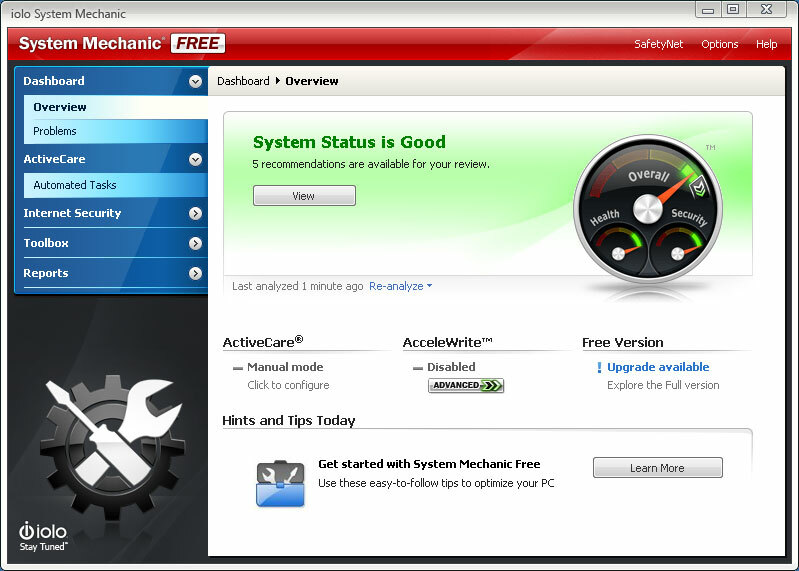 System Mechanic Free keeps your PC running at peak performance and stability with advanced PC optimization, repair and maintenance features. Using 7 safe and effective tools, its exclusive patented technology fixes registry problems, defrags hard drives, cleans up junk files, accelerates downloads, boosts Windows speed and ensures maximum ongoing system stability. Consistently top-rated since 1998, this award-winning performance solution has been used to keep over 75 million PCs worldwide problem-free and running like new. - Registry Tuner: A safe, effective, and highly advanced problem solver and error repair tool, Registry Tuner can diagnose and resolve many common root causes of mysterious freezes, slowdowns, and crashes. - Startup Optimizer: Automatically eliminates startup bottlenecks that can choke the life out of a PC and make Windows take ages to start. Supercharges boot-times and frees up resources for improved overall performance. - Memory Mechanic: Reclaims system RAM orphaned by memory leaks and sloppy programs for improved system responsiveness. Optimizes and defragments memory for snappier programs, downloads, and gaming experience. - PC Cleanup: Performs a system-wide scan for junk and obsolete files left over from messy apps and unexpected restarts. Safely cleans out hazardous system-clogging clutter that accumulates over time through everyday use. - Drive Accelerator: Performs advanced hard drive defragmentation for accelerated Windows load times, program startup, and overall system speed. - Shortcut Repair: Finds and automatically fixes broken or corrupted Windows shortcut icons that can represent the root of frustrating problems on an otherwise stable PC. - Internet Connection Repair: Automatically heals broken and chronically unstable internet connections to get you back online and keep you connected when you most need to be. Statement: First, please download the orginal installation package by clicking the download link. Of course you may also download it from the publisher's website. Using System Mechanic Free crack, key, patch, serial number, registration code, keygen is illegal. The download file hosted at publisher website. We do not provide any download link points to Rapidshare, Hotfile, Depositfiles, Mediafire, Filefactory, etc. or obtained from file sharing programs such as Limewire, Kazaa, Imesh, Ares, BearShare, BitTorrent, WinMX etc. Software piracy is theft. If you like System Mechanic Free please buy it.